Facing several heavy machine and doing their jobs in the tower crane which is high from the ground, it is the routine of the tower crane operations. That is a dangerous occupation. However, compared to the danger of the job, the worse thing is the lack of safety sense, not providing any security solution which accumulates the danger of the work. To enhance the safety management and avoid the accidents, Todaair cooperates with the Beijing Qingteng Technology Company and comes up with a flexible and easy maintenance surveillance system for the real time monitoring and remote management. This project is located in a construction site with tower cranes. It is an open space and near the forest, with weak network signal. Meanwhile, the situation is complicated for the tower crane. Thus, the wireless option is the best choice in this project. There are two tower cranes in the construction site. After the field inspection, the control room will be set in the security office. 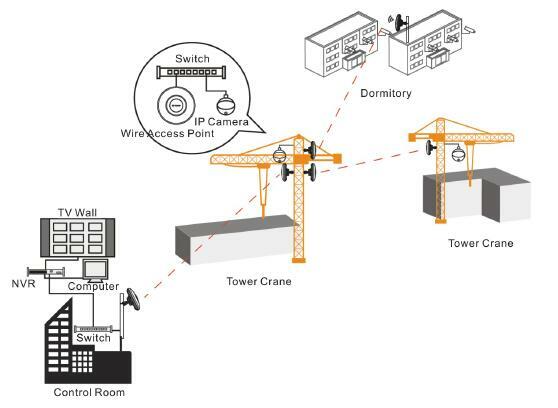 The tower crane which is near the control room will be set as the repeater, transmitting the signal to the control room in point-to-point mode, and spread the signal to the other tower crane and the dormitory for the wireless CCTV surveillance. The DIP356一H, Todaair wireless access point is selected in this project for the wireless link.This device is an innovative item with plug&play function, built-in intelligent auto-matching technology, easy installing on the tower crane, construction site and mine project. This left photo below shows the signal outside control room. The signal is transmitted through the wireless access point to the surveillance camera and the video data is sent back to the control room for monitoring. Through the monitors in the control room, all the operation in the construction site are under surveillance. It helps improve the construction management and supervision of the wireless daily operation. The right image above from the camera in the tower crane is very clean. It tells the wireless technology is rapidly growing and takes advantages on the installing, management, compared to the wireless option. And it’s involving in the transmission stability and picture definition.